After successfully calculating your display cabinet, you can add it to your cart. Product Information "Made to Measure Display Cabinet"
Do you have trouble finding a display cabinet that suits the individual needs of your collection? Perhaps you have models or specimens which are unusually shaped – or perhaps you simply have a clear mental vision of exactly what the perfect cabinet should look like. Either way, ordering a Made-to-Measure Display Cabinet could be the answer. 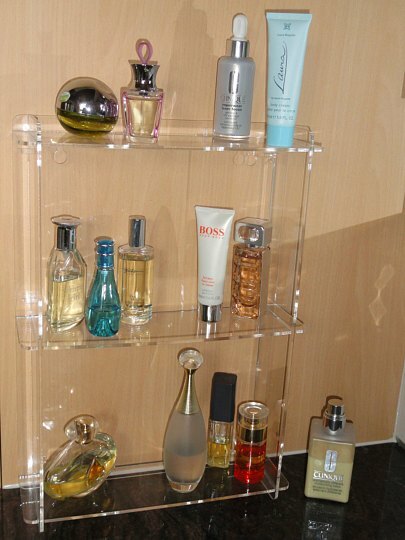 Many customer send us pictures of how they use their custom made display cabinets. Looking for inspirations? Then you might like to visit our Customer Gallery. Prices for a custom cabinet begin at €29, and vary according to the size and features you are looking for. Best of all, there’s no need to wait to find out how much your dream case will cost! By using our customisation tool, you can calculate the exact price and, if you’re satisfied, add it straight to your shopping cart so that we can begin making it for you as soon as possible. Due to the nature of acrylic panels, some combinations of dimensions (eg, a case which is 75cm tall and 75cm wide) are not possible. Making cases with these combinations would be very likely to result in breakages, which of course we work hard to avoid. Other combinations are possible, but may result in a different shipping option being used (our standard shipping option can only handle packages of certain sizes). If you select a combination of dimensions that could cause problems, an error message will appear. You may then adjust your chosen dimesions so that you can go ahead and order right away. If you have any questions or problems, please feel free to write an e-mail us on info@sorashowcases.com and one of our friendly staff members will be able to help you out. Step Three: Decide whether you want your cabinet with or without a front panel, and select the appropriate response from the drop down box. 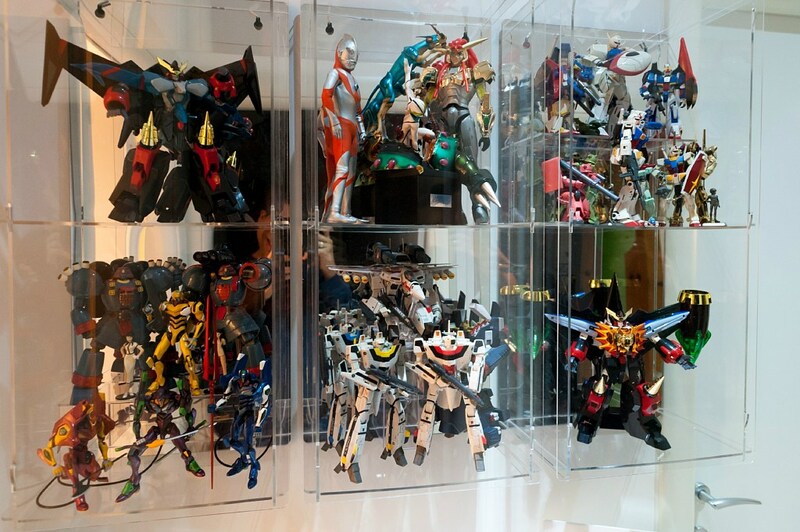 Adding a front panel costs a little extra, but will help protect your collection from visitors, children and pets. Step Four: Choose the type of back panel you would like for your cabinet: transparent, reflective or black. Think carefully, because this will affect the appearance of your display. You may like to look at the sample pictures provided on this website to get an idea of what the different back panel options look like. Step Five: Decide how wide you want your cabinet to be, and select the appropriate number from the drop down called ‘Width (Outside)’. Then, select how tall you want your cabinet to be, and select the appropriate number from the drop down called ‘Height (Outside). Step Six: Decide how deep you want your cabinet to be, and select the appropriate number from the drop down called ‘Depth (Inside) ’. Step Seven: Click on ‘Calculate Now’ to produce a list of the specifications for your custom cabinet. If there is a problem with something you have entered, an error message will appear, explaining what you need to do to fix it. If everything is fine, you will see a summary which includes the dimensions of your cabinet, the number of shelves and compartments it will contain, and the price. Step Eight: If you are ready to order, go ahead and click on ‘Add to Shopping Cart’, then click on ‘My Shopping Cart’ to review postage costs and check out. Alternatively, you are welcome to adjust settings as many times as you like until you find the custom cabinet that perfectly suits your needs. Step Nine: We will build your cabinet and ship it to you in approximately five working days. It will arrive as an easy-to-assemble kit (with illustrated instructions included) and requires no tools or adhesives to put together. And remember: If you have any difficulties in the course of ordering a custom cabinet, just call Sora Shop on +49 36921 91434 or email us on info@sorashowcases.com We’re always happy to help! You can choose between different designs of the back-panel (black, transparent or reflective) as well as you can order your individual showcase with or without a front-panel. The number of shelves as an input field means how many horizontal layers your rack is supposed to have, whereas the number of columns equals the number of vertical units. The total number of shelves as a result of your inputs (number of shelves * number of columns) will be displayed below the input fields of the construction tool. All custom display cabinets are based on the proprietary sora connector system. They are delivered as an easy to build up construction kit. The parts of the construction-kit are joined with acrylic splines. Therefore you won't need any additional tools or adhesives to build up your rack. For further information about the construction principle of the display cabinet, please check our construction manual. 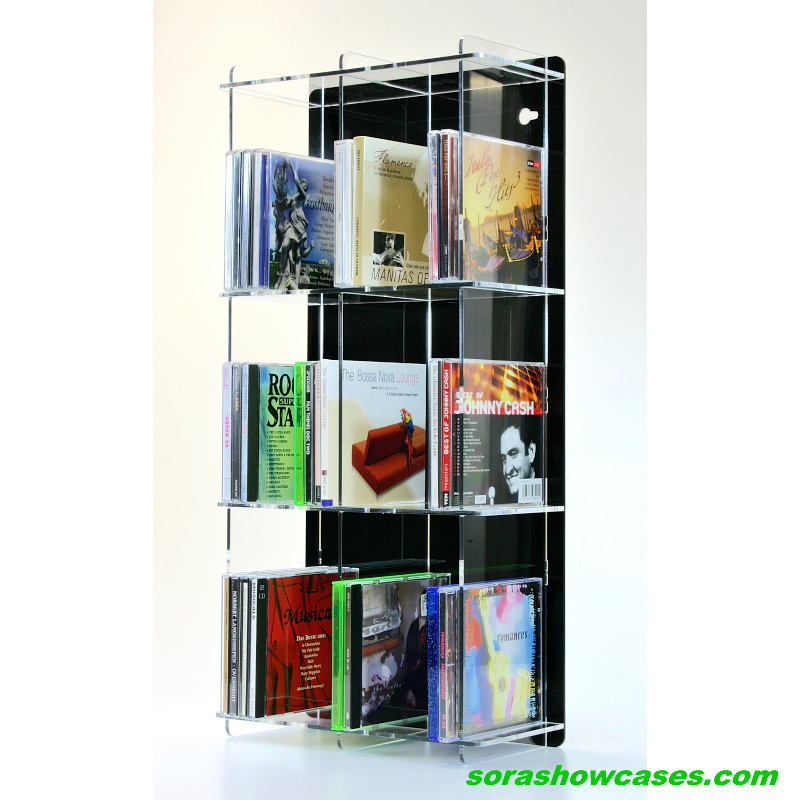 The single-columns version of an acrylic rack can be designed with a maximum width of 30 cm if the input for 'depth' is not more than 7 cm. If both measurements exceed these limits the shelves, there is the danger of the shelves bending in the middle if you put a heavier item on it. Therefore the online configuration tool will display an error message and suggest to either reduce the width of the cabinet, reduce the depth below 7 cm, or to insert an additional column. The front-panel is made of crystal-clear 3 mm thick transparent acrylic and can be attached to the rack by hook-mounting. The side-panels of the rack have acrylic hooks, which are designed to hold the front-panel. If you order your display cabinet without a front-panel, the side panels will have no mounting hooks. If a certain combination of settings is not possible, the online configuration tool will display one or more error messages. Please change the settings of your acrylic display cabinet according to the error messages. links to "Made to Measure Display Cabinet"
customer reviews on "Made to Measure Display Cabinet"
you WONT FIND BETTER !! HAVE 3 CABINETS ,1 STANDARD ,2 BESPOKE. VERY SATISFIED,VERY IMPRESSED, AND HIGHLY RECOMMEND . THE SERVICE IS EXCELLENT , I ACTUALLY MADE AN ERROR ON ONE OF MY CABINETS ( too small for scale 1:18). not only did they spot it , but contacted with error details and rectified dimensions . quality product + superb costings. Excellent product and service.I'm very satisfied I'll buy more for sure. I have ordered 3 made to measure display cabinets and have been really happy with the delivered product.Dispatch was very fast and on the second order [i was so pleased with the first by the way]the order was dispatched in less than 23 hours.The cabinets are easy to hang on a wall and my figurines look great in these sturdy well made cabinets.One tip is make sure the acrylic sheets are cool before you attempt to remove the protective backing;it makes it easier to remove. I've bought more cases from Sora-Shop then I can remember, and I won't look anywhere else. The service is fantastic and the quality amazing. I've purchased three of the display cabinets to date, I'm about to order up some more. The first one I read the dimensions the wrong way around, but I was able to reuse it for some Hot Toy figures. The second set was for some carded Visionaries figures, so I could display then in sets of four. These cases being light and wall mounted are perfect for MOC Action Figure displays. No screw needed either, to you can build it in a matter of minutes.